We welcome our latest technology partner, Out Of The Box Technology. A Diamond Level QuickBooks ProAdvisor, helping our customers integrate their ePS software to Quickbooks! Learn more: https://www.outoftheboxtechnology.com/services/eprocurement. Worldpay, Inc. is a leading payments technology company with unique capability to power global integrated omni-commerce. With industry-leading scale and an unmatched integrated technology platform, Worldpay offers clients a comprehensive suite of products and services globally, delivered through a single provider. Worldpay processes over 40 billion transactions annually through more than 300 payment types across 146 countries and 126 currencies. Secure, Compliant & Scalable PCI, HIPAA & SOX Compliant Hosting Solutions. DR Now! Comprehensive IT Disaster Recovery Cloud. Whether your business processes transactions in person, by mail, by phone, or online, we have ways to keep your transactions safe. OpenEdge is the integrated payments division of Global Payments (NYSE:GPN). A payments pioneer, Global Payments and its divisions have been on the forefront of payment processing technologies for more than six decades. OpenEdge is the result of Global Payments' merger and acquisition of industry leaders, Accelerated Payment Technologies and PayPros, forming a single operating entity processing through the innovative, secure Edge platform. 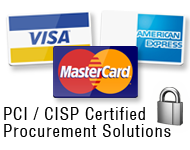 Processing solutions for: Credit, Debit, Check, Mobile, Gift, EBT, EMV®/NFC. Our software solutions are the best, but that's just the start. Our people, our customer service and our continuous innovation make us the clear choice. Please schedule a demo today! © 2019, eProcurement Services. All rights reserved.